Over 300 young farmers recently attended the Young Farmers’ Clubs of Ulster Association’s AGM and conference, sponsored by Massey Ferguson, one of the world’s leading tractor brands. The event was held at Armagh City Hotel. YFCU put together an informative morning programme for members and delegates from sister organisations Macra na Feirme, the Scottish Association of Young Farmers’ Clubs and Welsh Young Farmers to take part in. The association’s most eagerly awaited competition also took place just prior to the AGM. Four clubs had made it through to the final of the Club of the Year competition sponsored by Power NI. 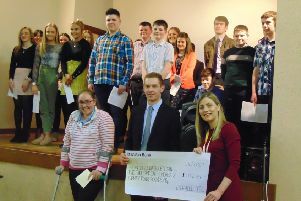 Dungiven YFC, Donaghadee YFC, Randalstown YFC and Holestone YFC took part in a quiz to determine the winner. After a nervous wait, Dungiven YFC were announced as winners and received the Club of the Year trophy. The Club of the Year competition was established in 2012 in memory of former YFCU general secretary Arthur McAllister.